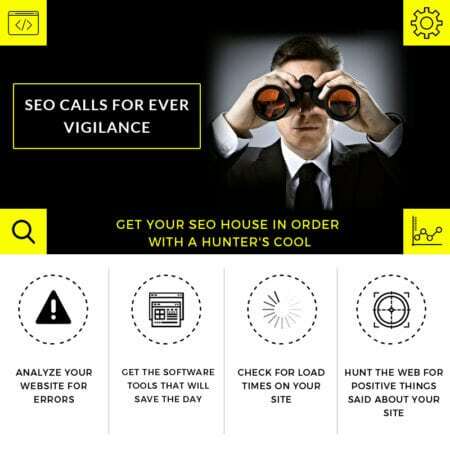 SEO calls for ever vigilance. It’s not something you do once and let ride. You’ve got to keep your game going and that takes time and effort. It also calls for having a “Hunter’s Cool” to analyze your site and make the right moves or end up dinner. SEO nowadays is more of an art and science than technique. There are advanced AI systems at work and it calls for the most adept in strategists to keep tabs on things and even outguess them. Only a rare handful can but in the meantime, all we can do is keep that sharp eye out for opportunities that we must employ or that others may have unwittingly missed. Number one is to check and analyze your website for errors and missed opportunities. This calls for looking for misspellings and code errors, improperly tagged pics, videos, graphics, rotten linking and more. You have to be objective here and have someone double check your work. What you may miss, others may recover. You can’t afford to fall short or your competition will walking all over you. Get the software tools that will save the day and make your life easier. Keyword and competitor analysis software is essential. You want to get those keywords that are hot and just laying around waiting to be harvested as well as those keywords your competitors have yet to exploit. The old saying ‘The early bird gets the worm.’ is highly applicable here. Check for load times on your site. Don’t cram big graphics and make sure your contact info is on each page with fine tuned navigation. Hunt the web for positive things said about your site and post them on your blog and on relevant pages with links to them from your main page. As time goes on you’ll build up more relevant content that will be to your best interest which you can further exploit with finesse. Make sure to regularly peruse your site so that pages are right and working and that people aren’t linking to dead pages. Clean up that 404 mess by checking your site and sites you’re linking to. A messy website is a no-no for Google as it shows unprofessional and sloppy attention and work. Now the hunt is on to find out what others are doing. This means prowling around your own social media sites and then social media at large. Look for what’s going on in your industry and especially where your site and services are concerned. Here is where you can find trending and future trending keywords, keyphrases, and keygroups. You can mine people who are from the top popular posters and shmooze with them to send a link to your site especially if they have an authority site. If not, just a blurb on their blog with a link with the keywords you want is sufficient. Don’t be afraid to ask them to include those keywords, most people are aware of the importance of keywords so don’t be shy. Thank them, support their posts with likes and shares. Your competitor’s blogs and social networking sites are dangerous territory but you can sneak in anyway, undetected and see what’s going on. Just don’t blow your cover as you milk those keywords they’ve neglected to exploit. Overall, what you’re doing is what humans do best, hunt. You’ve got the skills and innate tools and the web is just as good a place to put those hunting skills to the test than anywhere else. It takes a keen eye, smarts, ingenuity, craftiness, communication, good manners, and a hunger for success that nothing can get in the way of.